Here's another one of the cards I made over the weekend and a sneak peek of one of the fabulous sets coming your way with the new Stampin' Up! Autumn mini catalogue. 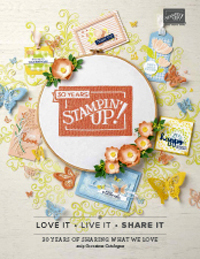 This gorgeous vintage inspired set by Stampin' Up! is called Nature Walk. As you can see it lends itself to several different styles of stamping. I just love the little flower spray in this one which looks fabulous cut out as an embellishment. The vintage stamps look great stamped all over the newsprint DSP as well, or on a background as I have done in the first card. I have dyed the crochet flower in coffee to complement this card. Did you spy the new embossing folder in the first card? This is gorgeous and looks great just framing a simple cluster of elements as I have done in this card using pieces of one of the new DSPs with a botanical theme. Don't fall over, but I have some Stampin' Up! cards to show you today. I just checked back and rather embarrassingly realised it's been over 2 months since I posted a card! I'm sorry but most of you know that life is taking me in many different but fabulous directions this year, so creating has been very much a hobby for me again. Luckily for me though, we get to preorder new mini catalogue products, so I didn't have to wait as long to play with these fabulous new goodies from the new Stampin' Up! Autumn Mini Catalogue. I wanted to make some samples for my customers, and managed to make 5 brand new cards, so here's one for my blog as well. This set is called Strenth and Hope, which I love as much for the sentiment behind it as the delicious vintage loveliness. It's great for layering and lots of random stamping, and of course pearls and antique brads. Here is another card I made, or should I cased using the great example and template provided on Laura's blog. I just loved Laura's sample, so made up this one for my MIL's birthday. There's still time until Thursday evening to grab your last minute Summer Mini sets and Saleabration freebies. Then it's the brand new mini catalogue starting selling on Friday. You won't want to miss the new mini catalogue. 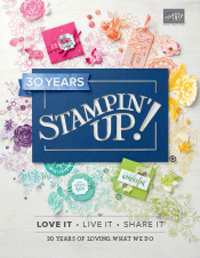 There's a couple of great new punches, 3 new DSPs, new embellishments and some gorgeous stamp sets. If you haven't already, contact your demonstrator and get your copy this week. If you don't have a demonstrator, email me and I'll put you in contact with a demonstrator close by so you can view the products, grab a catalogue or maybe even attend a class. I've been busy with lots of others bits and pieces which is why I don't get to create so much these days. Our puppy Oscar is now nearly 4 months and has grown lots and is now in advanced puppy training :) He's a bundle of fur and energy but we love having him in the family. I've achieved March's task for my OLW project, which was to do one little thing in line with my word 'nourish'. I just need to write that one up. 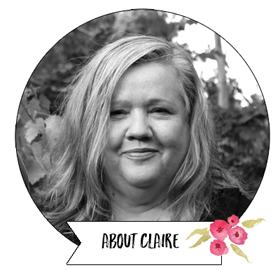 I have also started dabbling in digital scrapbooking, which I think I LOVE! I can't see it ever overtaking paper scrapbooking for me, but I love I can get some quick pages done without making a mess. Here's my first ever digital page, which I made super easy using a Cathy Zieleske digital template. So easy! My practice is going really well. I totally love being back in my career again and I can see how much I missed it. I'm enjoying learning new things and helping my clients and being among other health professionals again. I only actually see clients 1-2 days a week, but have another couple of APD's working for me on other days. I love going into Kew on those days and being amongst the hustle and bustle on inner Melbourne. I imagine it would be very different if it was full time, but for now I love it. The weather has become lovely autumn days in Melbourne, with cooler nights. I've found myself looking for warmer recipes this week and the grills and salads and bar-b-ques are becoming less frequent. Maybe this will change the way I eat again. I have found myself not feeling much like red meat over the summer, but this week I made a delicious Donna Hay recipe for baked veal shanks from her Modern Classics #1 cookbook. It was flavoured with thyme (from my garden), lemon and garlic and much lighter flavours than many of the traditional tomato and red wine versions. It was absolutely delicious and so easy (everything just gets baked in the dish). I would thoroughly recommend it. Autumn is a lovely season for the garden as well. We still have roses blooming from summer, and it's warm enough for the pansy's and herbs to be growing well, but there is also promise of lots of fabulous things to come. Here's some pictures around my garden today. This first photo brings a smile to my face. This is from a potted Sweet Jane Camelia that my Mum gave me quite a few years ago. On the scorching hot day of Black Saturday, even though it was on my patio in the shade, it was really scorched and I thought for many months after I was going to lose it. I hasn't flowered well at all the last two autumns, but this autumn it has stacks of buds on it. I can't wait until it bursts into flowers again. Nature is such a good healer isn't it? and the herbs and pansies the kids and I planted a few weeks ago are powering along. I'm all caught up on my One Little Word project that I'm doing led by the amazing Ali Edwards. I'm loving this project and just as much loving sharing it with my friends Nikki, Sue and Kathryn. If you are also doing this course and sharing it on your blog in Australia can you let me know? I'd love to follow your progress too. I haven't shared any of my album yet, so this coule be a long post! I am using an 8.5 x 11" D ring album for my project, which has room for a customised section which I did with the computer and some stamping. I have chosen the colours Blush Blossom and Pear Pizazz to team with the black and white throughout my album. That combined with a favourite paper with those colours that I've had in my stash for a while, will appear in bits and pieces throughout the album - as will stamping of course! For my title page, I have kept it very simple. On the reverse of my title page I have a photo, which I don't particularly like, but I wanted to use the most recent one I had when I started the project on 1st Jan, so I did. Hopefully I'll get to include lots of better ones as the project goes on! My word is "Nourish" as you can see. Nourish - to supply what is necessary for life, health and growth; to strengthen, build up and promote; to cherish and foster. Nourish - attend, cherish, comfort, cultivate, encourage, nurture, tend. The quote I chose doesn't actually relate in much of a way to the word nourish, but it's one I love about self growth so I included it because I couldn't find any good nourish quotes (if you know of any please comment and let me know). Here's how I presented this page (I have chosen not to share all my journalling here). I stamped over the journalling blocks using Stampin' Up! 's 5th Avenue Floral and Aviary stamp sets, in Blush Blossom and Pear Pizazz. Here's a close up of some of the decoration blocks. and this one just for fun. I found a sticker sheet I had with the theme of self growth and some of these stickers will be popping up in my album for sure. Here's my 9 photos of how I observed / reflected on the word nourish during this past month. I also added a couple of extra 5x7 photos (I didn't take these pictures, they are stock photos but they represented two important goals to me). I did some journalling on these to remind myself of two goals I have for 2011 related to my word. The first is to get out into nature more because everything about nature nourishes me and makes me feel alive. The second goal is to find more time to be still. I used to do meditation when I was trying to get pregnant, and since the start of the year I have re-introduced it to my life. I had forgotten how much it feeds, calms and strengthens me. So that's where I'm up to, and looking forward to what March brings for my One Little Word. It's been a fabulous day in Melbourne day, one of those gorgeous autumn days. As I type this (at 6.55pm) my boys are still outside the window playing dodgeball and laughing their heads off. Makes me happy. I have some pages from my Hamilton Island Incentive Trip scrapbook album to share today. I'm sorry for the awful photos. but I used divided page protectors on lots of these pages so even in natural light they were a little hard to photograph. All up I did 24 pages, but still have some a couple of last photos to add in to some of the pages, sp will just share a few here. I loved doing this album. I think Hamilton island has been my favourite destination of the three Incentive Trips I have earnt, and this is a nice reminder of the beautiful scenery and my lovely friends I shared the trip with. Sadly I won't be going on this years incentive trip. 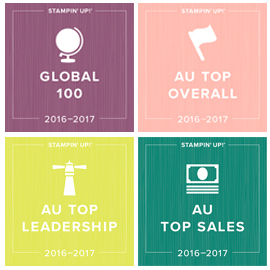 Last year was a busy year for us as a family and I had a much quieter year with Stampin' Up! so I could cope with all of Josh's IT appointments and planning my dietitian business. I know I will miss the chance to catch up with some of my lovely friends, so thank goodness for convention coming up! Anyway, here's a few pages from my album. Don't you love that Stampin' Up! sign Miriam drew in the sand on Chalkies beach? and woops to the title section falling out while I was photographing this page! As you can see I have used the Stampin' Up! Island Oasis DSP on these pages. The colours really suit photos with the ocean in them so were perfect for these pictures. My titles were done using Rose Red cardstock and my Bigshot (Typeset alpha dies). I have also used the Saleabration set Blissas an accent stamp and behind the journalling pages. I love this set! If you would like to buy this DSP and/or earn the Bliss set for free with a $100 order, you only have until the end of March so get in quick. Just email me if you have any questions. In other news around the Daly household, can't believe we are into our 5th week of the school term! Sam has his last Wednesday at home this week and then it's school full time. I am really going to miss our "mummy and Sam days" and know next week is going to worse than school starting for me! Luckily I have managed to get a class reading spot, so I get to sneak in on Mondays, lol. We have been planting a few pots this week too, as autumn starts. Autumn is my favourite gardening season. In April I will be heading off to the International Flower and Garden Show. I love wandering the Carlton gardens and looking at all the floral and garden displays and checking out the newly released plants. I also love picking up my bulbs from Tesselaars to plant in pots on the balcony. My favourite potting bulbs are tulips and hyacinth and grape hyacinth. This week the boys and I planted some herbs and pansies in balcony pots and lifted up the shades on the side of the deck to let the sunshine in. We need to keep our potting behind our temporary fencing at the moment while Oscar is still in his ratbag puppy stage! So far no damage (touch wood!). Here's some pics of our new plantings (nothing like gardening in your school uniform - woops!). and here's a picture of my Mona Lavender which is flowering. This is a lovely plant for a pot and a find from the garden show years ago when I went with my Mum (I think Josh was only 1 at the time, so 7 years ago). The foliage is a gorgeous deep green with lovely pale lavender flowers in late summer early autumn. It's super easy to strike from cuttings too so if you live close by and want to grab a piece let me know. I love sharing my plants. Stamped invitations with Stampin' Up! A funny thing happened on the way to making these birthday invitations using Stampin' Up! Lap of Luxury Designer Series Paper. At first I didn't think these colours (Predominately Pretty in Pink, Concord Crush, Basic Gray and Very Vanilla) were me, but chose them because they were very much my Mother In Law's colours, for whom I was making the invitations. Now I love the paper and can see lots of possibilities for using it. It's gorgeous and very elegant. I think I will try a vintage inspired card next using this DSP. I was going for an elegant look (it's her 70th birthday). Paul told me (in a positive and admiring way might I add) that they were very exotic which I am not sure is the look I was after but a nice compliment all the same! My colours were Pretty in Pink, Concord Crush (with a mat of Perfect Plum). I have used the Bliss saleabration stamp setto stamp the flourish in Concord Crush on the card, and in Pretty in Pink on the inside and the envelope (had run out of Very Vanilla envelopes) :( A quick border using some DSP and the Eyelet Border Punch, a butterfly made using the Stampin' Up! butterfly punch and two pieces of DSP and a rhinestone brad, and the greeting which came from one of my prize sets from convention last year Compliments to the Chef. For the inside (excuse the pic but I had to block out details) I printed the details up in a colour match to Concord Crush (here'sa great link to get the RGB values to pop into the custom values in your word processing program or MS Publisher) onto Very Vanilla cardstock. Once I had cut each one out I stamped the flourish from Bliss in Pretty in Pink onto the background. I also stamped the flourish onto the envelope where I was going to write the address. I've made a few more creations over the last few weeks which I have popped onto my Facebook page, and also sent out in my newsletter (you can sign up in the top right column). I'm planning on getting stuck into some more creations soon, so I'll be back soon. Don't forget you now only have one month to grab yourself one of the FREE Saleabration sets with a $100 order. This is also the last month of the Summer Mini Catalogue.